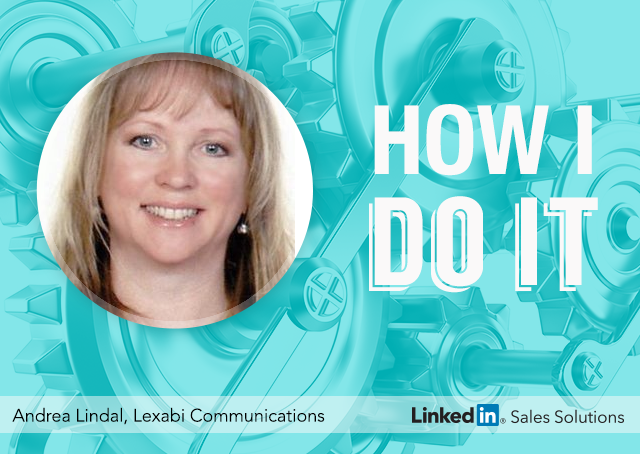 As part of the “How I Do It” campaign, sales expert Andrea Lindal shares how she makes social selling for her business work. Learn tips on how you can enhance your sales strategy and become a more successful and effective sales professional. To take a holistic approach to digital marketing means understanding the multi-marketing channels that will elevate your brand and ultimately lead to revenue generation, but it takes time, patience and dedication. It’s important to be highly efficient in several methods of online communication and have a deep understanding of how they work simultaneously and individually. There is etiquette in being social and that’s often as simple as saying ‘Thank you’. It’s a misuse of digital communication to use a platform that does not ‘fit’ with your brand and/or remains stagnant. One must recognize the importance of leveraging digital media within itself and pairing it with traditional methods to create a marketing plan that is cohesive and full circle. The funnel may start with many entry points but we drive our audience to one defined place... there is no room for confusion. A day in the life of a digital marketing professional is thick with communication and creative strategy building. The days often consist of helping people understand that to be truly effective with their online sales initiatives; they need to build relationships, influence and patience. In this technologically driven communication world, being impatient will lead to frustration, early campaign abandonment and unmet expectations. Understanding & embracing today’s human purchasing behavior is key to digital sales success. People want to be in control of their buying decisions and it’s our job to create a top-of-mind presence. We work with different industries throughout North America but find that there are many commonalities with social marketing and it all begins with a simple plan. One of the most common mistakes: not understanding that all social marketing channels are different and unique. The message is the same but must be tailored to the medium. Willy-nilly is not the path to success. Tailor your message to your audience and gauge their tolerance levels and how they engage with you… or if they’re engaging at all. Listen to your audience, understand them and be flexible enough to make changes to meet their demands. Here’s a short example of how one very simple message can be ‘tailored’ for different platforms (keep in mind that these are simple examples only – never forget the details, limitations and ever-important CALL TO ACTION on everything you do). In our example we will tell people about an upcoming workshop. We will use Facebook, LinkedIn, Twitter, our eNewsletter and a local newspaper ad. You’re invited to Lexabi Communications Digital Marketing Workshop! DIGITAL MARKETING – Learn how to make it work for your business. Visit lexabi.com for all the details. On a side note, hashtags (#) are part of using social correctly and to its fullest potential but not every platform uses them. A couple of useful hashtag tools include: keyhole.co - check to see how used your hashtags are; hashtags.org - shows you what hashtags are trending. After the goal is identified, revisit your campaign history to know the ‘why’ of what worked and what didn’t. How was the last initiative disseminated and who was your target market? This should lead to a list that will start to propel your new campaign strategy. This simple exercise alone is commonly overlooked. Perform a competitor analysis. See what your competitors have done, or what they’re currently doing. It really gets the creative juices flowing to pick apart a few competitor campaigns! Marketing/Promotion tools – social media, newsletters, video, website, blog, coupons, etc. Digital marketing is largely about content and communication that is timely, authentic and tailored to the audience. No matter the marketing platform(s) we use, it’s how we interact with our audience, our peers and our customers that will determine our success more than ever. This may feel like a long and painful exercise, but it’s really not. It’s simply putting most of what you’re likely already doing into a succinctly organized plan so that execution can be controlled, monitored and then measured to get your best ROI. Then, when it’s time to do your next campaign, you’re ready to go again and be even more successful! Even if you’re a small business trying to create your own strategy, content and promotions, remember that consistency is key. Keep your brand on track, your content in tone and your presence well known. And remember that sometimes it’s as simple as saying ‘Thank you’.